Hope you're all doing well and having a great weekend so far? I just wanted to say a huge thank you for all the lovely and kind birthday messages I had the other day! I had a fantastic day with my family and Daniel and I was definitely spoilt. It feels amazing to have a few extra days off and I have a few projects in the works at the moment, so it's nice to have some time to develop them that bit further too. 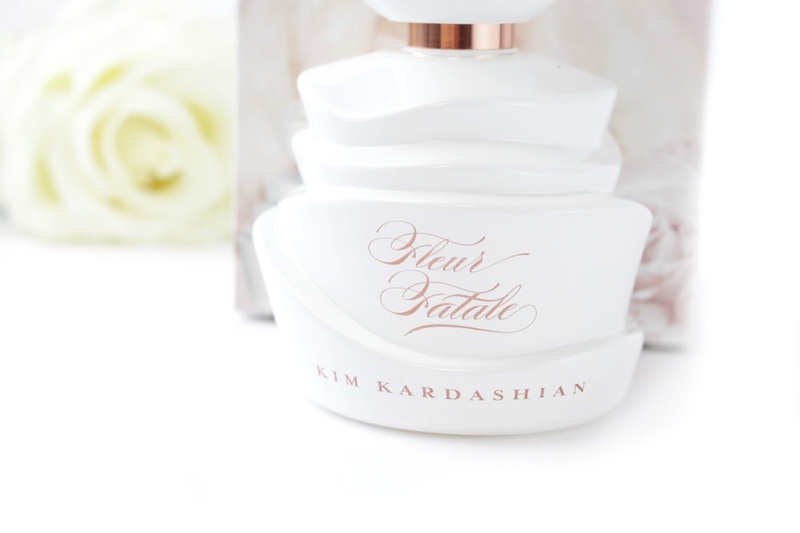 Recently, I've been trying out Kim Kardashian's latest fragrance Fleur Fatale and I must admit I'm pretty impressed. I believe this is her seventh fragrance release, but I haven't actually tried any of her previous fragrances, so I was pretty excited to see if Fleur Fatale was something that I could see myself wearing on a daily basis. I hope you enjoy this review my lovelies and I would love to hear your thoughts in the comments section below. If you would like to get hold of me a little quicker, then you can always use my social media icons just to the right hand side of my blog. It's safe to say that Kimmy K is a lover of 'White Roses' especially after Kanye surprised her with a wall of White Roses for Mother's day. Now you might love her or hate her, but I'm still in awe of her flawless contouring.. and actually I really like her latest perfume 'Fleur Fatale' too! I haven't tried any of her previous fragrances, but from my research it seems a lot of them have been more suited to evening wear. Fleur Fatale was developed by Swiss flavouring and perfume manufacturer 'Givaudan' and is different from Kim's previous scents, as it's describe as being beautifully floral and elegant. It opens with fresh Blackcurrant, Bergamot and Violet.. followed by Iris, Tea Rose and Peony, whilst Amber, Sandalwood, and White Musk provide a warm and intoxicating finish. I wasn't quite sure what to expect from this fragrance, but in all honesty it is really really pretty. It smells like a beautiful garden full of blooming flowers and it's perfect for wearing on a daily basis. I would say that Violet and Rose are the most prominent notes that come through on my skin and for me that's amazing, as I'm a little obsessed my Rose at the moment. I also had to mention the bottle, as it's super gorgeous and again is sculpted on Kim's love of White Roses. The finish of the bottle is in a high gloss and the delicate Rose Gold details make it a real beauty for your vanity table too. I also think £30.00 (50ml) is quite a good price point, especially for an Eau De Parfum. The scent lingers around, but it isn't too overpowering or overly sweet.. so it would be great for someone who likes more gentle, elegant and floral fragrances. I can definitely see me wearing this lovely scent on a daily basis and of course it looks absolutely beautiful in the bottle, so I will be sure to feature it on my new vanity layout. Days off are such a rarity, they should be enjoyed. I knew nothing about celebrity perfumes, so this is all news to me. Ooo how dreamy does that bottle look! You did a great job at describing the perfume, they're so hard to explain! I'll have to have a spray next time I'm shopping! I actually dig the bottle, its very pretty!